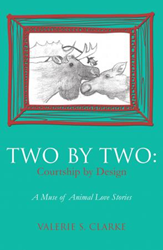 Valerie S. Clarke’s new book Two by Two: Courtship by Design - A Muse of Animal Love Stories ($16.49, paperback, 9781498480031; e-book, $8.99, 9781498480048) seeks to illustrate God's love for humankind by unraveling courtship behaviors within the animal kingdom. While it may be playful, it illustrates a vast picture hidden within creation. It represents the pursuit of God for each person He created. He loves us that much — to intertwine himself, his purpose, into every carefully crafted living organism. Through pursuit, He reveals His own heart for us as He seeks our hearts to be bound with Him. Valerie S. Clarke has a background in biology, education, and journalism, but her decades old love relationship with the Lord, allows her at least a partial view of the world through His eyes. Between the time she spends "on God's lap" learning and growing, and the time spent in fascination with His creation, she gathers unique perspectives to share with others. Clarke’s love for literature, music, poetry, and the visual arts, also lends itself to both the perspective and outcome of her book. Xulon Press, a division of Salem Media Group, is the world’s largest Christian self-publisher, with more than 12,000 titles published to date. Retailers may order Two by Two: Courtship by Design - A Muse of Animal Love Stories through Ingram Book Company and/or Spring Arbor Book Distributors. The book is available online through xulonpress.com/bookstore, amazon.com, and barnesandnoble.com.